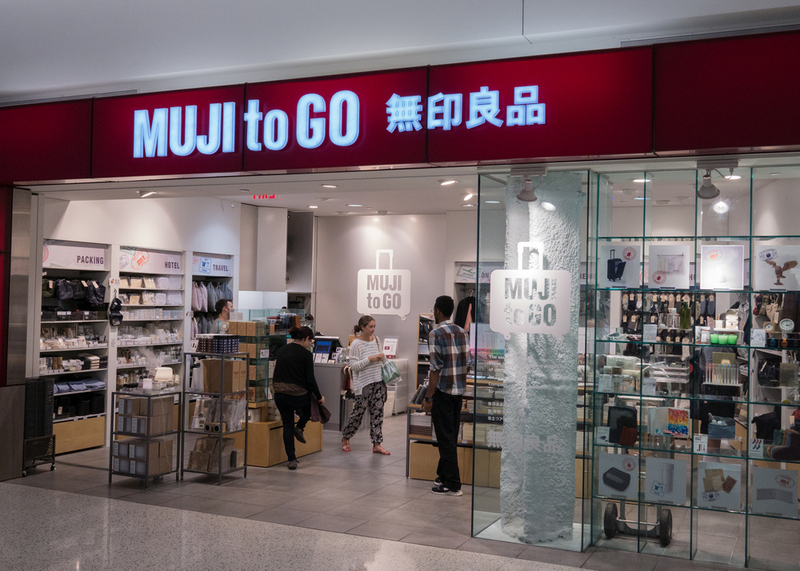 As I tweeted about at the time, I stumbled upon a "Muji to Go" store at Terminal 5 of JFK Airport last month. Relatively few good things happen to me in airports, so it was a pretty exciting find. If you're not familiar with Muji, it's a Japanese company that sells a fairly broad range of products. This includes everything from clothes to gadgets to luggage to – you guessed it – pens and stationery. While Muji pens and paper have established a cult following among writing enthusiasts, it's not necessarily a high-end Japanese stationery brand. Their corporate philosophy is quite fascinating. Minimalism is the common thread, to the point where they don't actually put their brand name on any of their products. New York shoppers who can read the characters in the Japanese label (無印良品) immediately get the inside joke. The first character, 無 (mu), means “without.” The second character, 印 (jirushi), means “brand.” “Muji” is simply short for “Mujirushi Ryōhin” or “brandless quality goods." 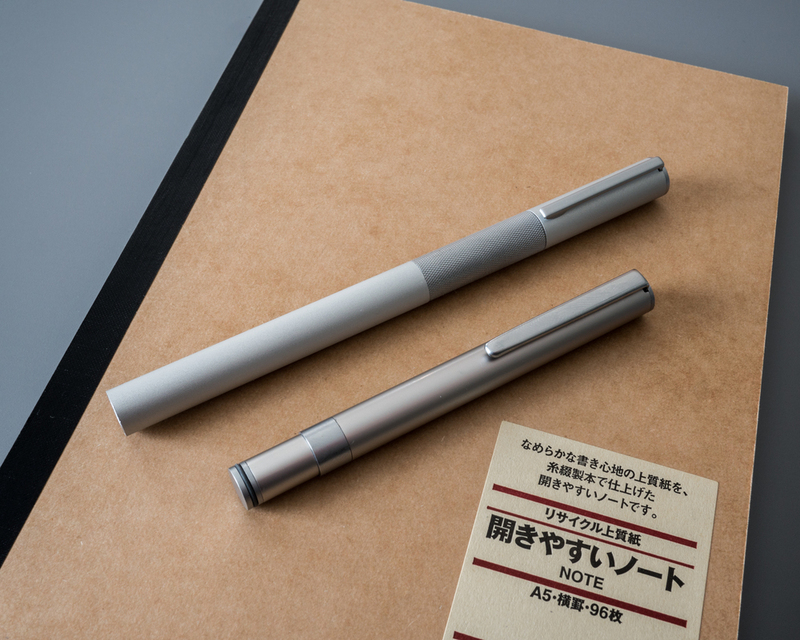 Aluminum Round Fountain Pen, priced at $15.50. 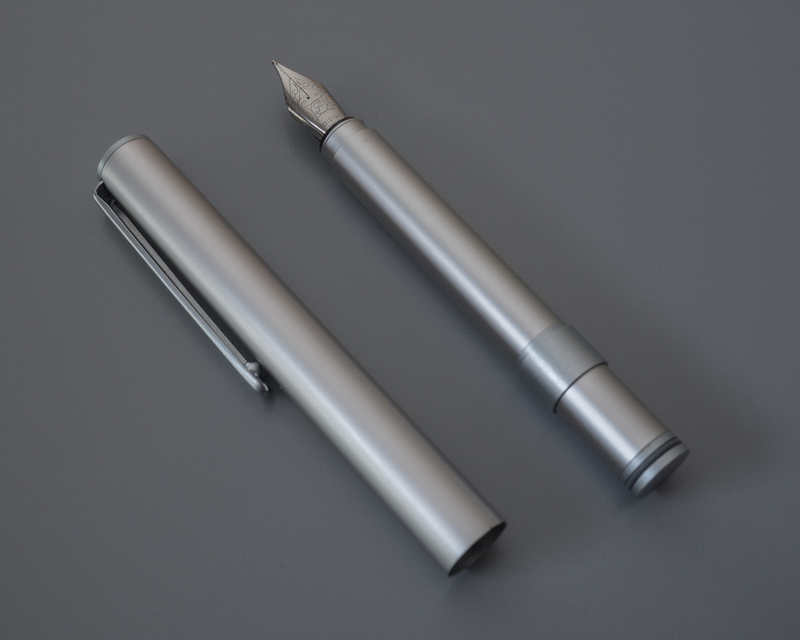 Aluminum Compact Fountain Pen, priced at $19.95. The fundamentals of both pens are very similar, so I'm going to cover them both in one review. 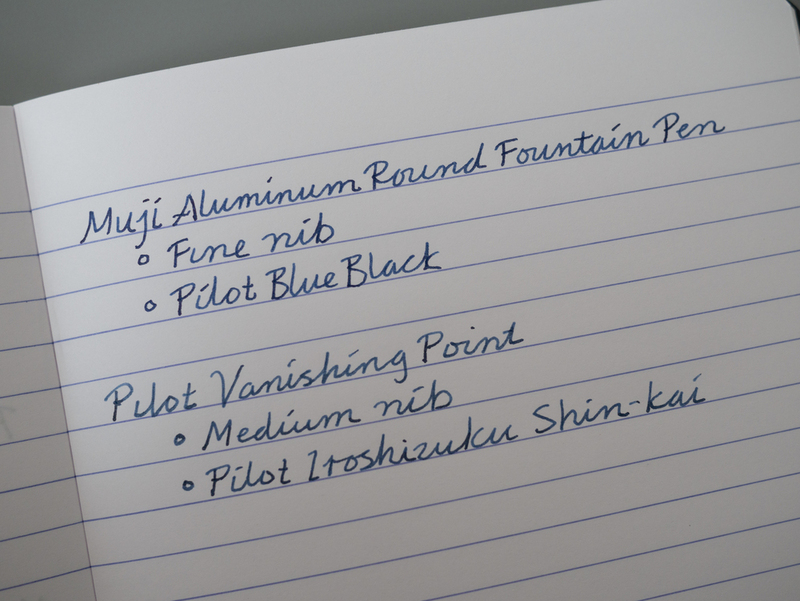 True to the Muji ethos, both fountain pens have a clean, minimalist design. In case the names didn't give it away, both pens are made out of aluminum. 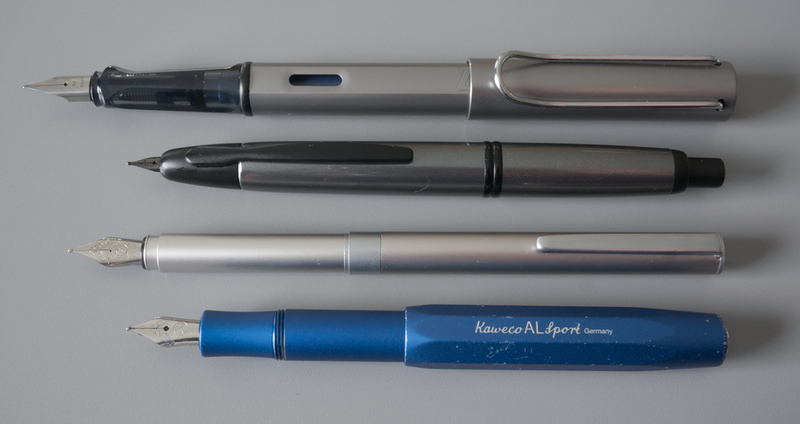 While they don't have the premium feel of something like the Kaweco AL Sport, they do feel sturdy. 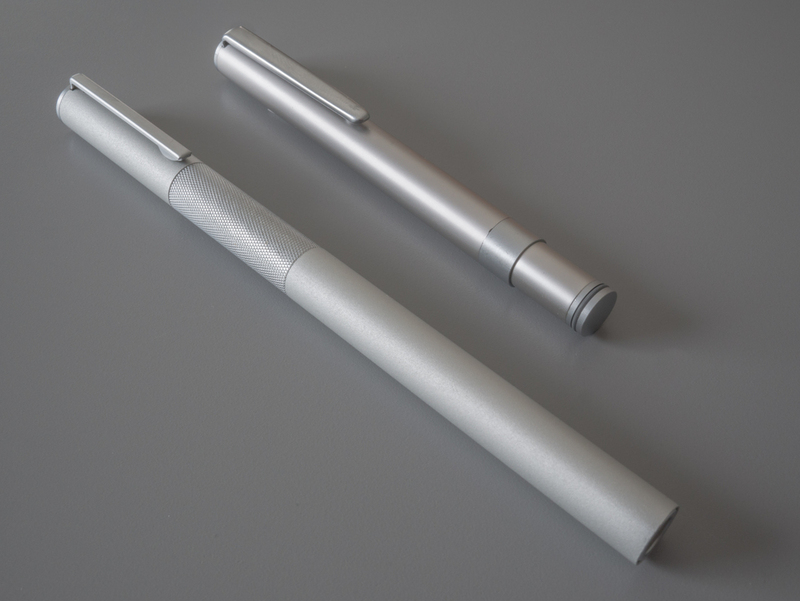 The Aluminum Round Fountain Pen is the more conventional of the two pens. It has a pull-off cap with just the right amount friction to both stay in place when capped and come off easily. The top of the barrel also has a corresponding spot to accept the cap when it's time to post it. It's a clever design, though I do find that I need to concentrate a fair bit on my aim when it's time to post or cap the pen. The Aluminum Compact Fountain Pen shares many of the general aesthetics of its larger sibling in a pocket pen form factor. When it's capped, it's in the same size range as the Kaweco AL Sport. When you pull the bottom of the pen, the "business end" slides out with a fairly satisfying click. When you invert it and slide the two pieces together, you end up with something that is surprisingly around a medium length pen. The Aluminum Compact Fountain Pen's unique posting method is all friction based. There is a small rubber gasket that gives it smooth feel as it slides in and out of place. Both pens have the same iridium point nib. Fine seems to be the only nib option. It's more of a Western fine. As you can see, it lays down a line in the same ballpark as a Pilot medium. The pens take small standard international cartridges. Muji includes a cartridge with each pen, but there are also many compatible third party options available. For my testing, I inked up the Aluminum Round Fountain Pen with Pilot Blue Black and the Aluminum Compact Fountain Pen with the included cartridge. I went in with somewhat low expectations, but I was pleasantly surprised by how well both of these pens write. Both write very smoothly, and I've had zero issues with skipping or hard starts. They also hit the not too wet and not too dry sweet spot that I prefer for everyday use. They are no means the best pens I've ever written with, but I've definitely fared worse with much more expensive pens. I'm less enamored with how the pens feel in my hand. The Aluminum Round Fountain Pen feels similar to holding an X-ACTO knife. That not a bad thing per se, but it kind of feels more like a tool than a writing instrument. I also have some minor nits with the compact version. While the design is pretty ingenious overall, I do feel a bit of cap wobbling when the pen is posted. I think most people would be fine with it for quick pocket pen stints, but it does grate on me a little bit. The fit and finish on the pens is middle of the road. 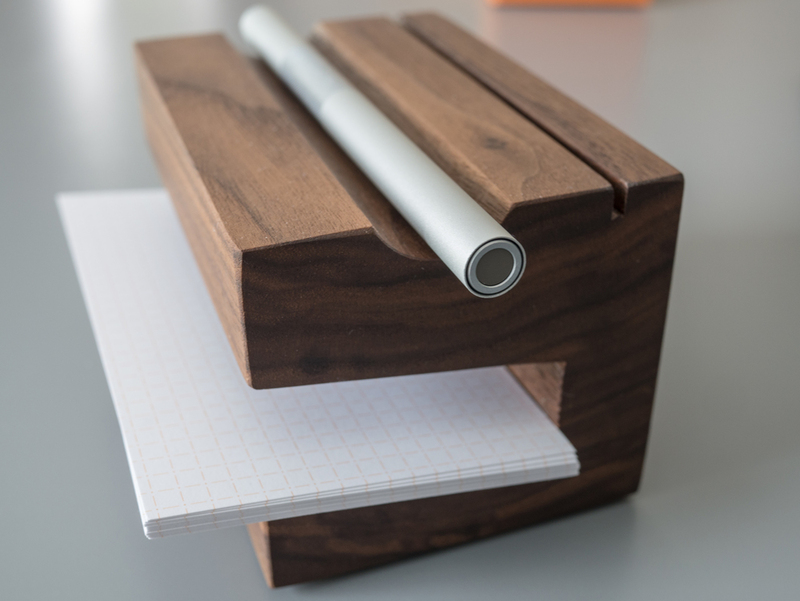 If you can imagine Ikea making a fountain pen, that's kind of what it feels like. It looks nice and is well-designed, but it's probably not something that will you will hand down to future generations. That said, the quality seems very appropriate for the price points. Both pens are fairly simple to disassemble and flush by unscrewing the grip section. The Aluminum Round Fountain Pen is a little easier to work with thanks to its shorter grip section, but neither is really problematic. I tried giving the nibs a little twist and pull to see if they were easy to remove, and they did not budge easily. I'm sure there's a way, but I decided not to push it too hard until I had a real world need to remove the nib completely. I think both of these pens are a good value. However, it's hard to imagine a scenario where I would recommend them over the Pilot, Lamy, and Kaweco offerings in this price range. 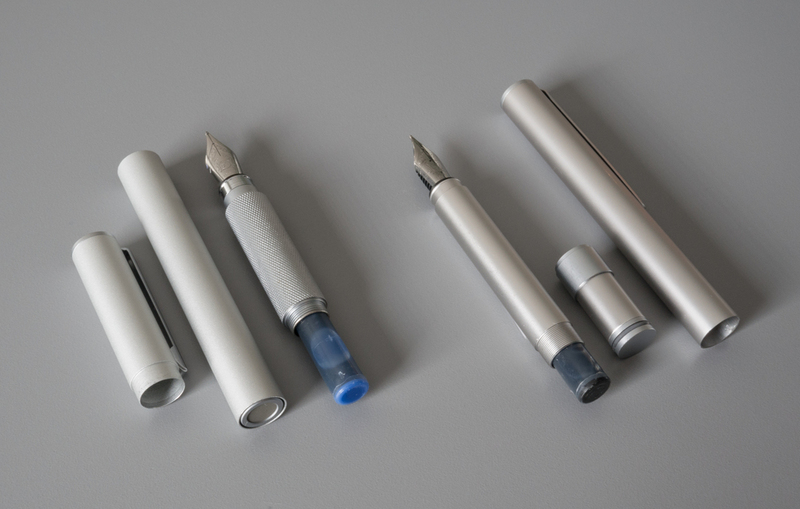 The tool-like feeling that I didn't like about the Aluminum Round Fountain Pen may actually appeal to some people. If that sounds like you, this pen is by all means worth $15. Economical metal pocket pens are also a rare breed. If you are looking for an inexpensive pocket pen that isn't plastic and can live with a little cap wobbling, the Aluminum Compact Fountain pen is worth a look.